I have been an avid cyclist since before I could walk. Starting with my first tricycle around the age of 3, working up to road bikes soon after that. Long distance is my favourite. It all began with long rides in Toronto Canada, usually to visit relatives several hours away. Then, slowly developed to having riden across Canada (7500km each way) twice. Now I enjoy exploring Cyprus, with its all year round favourable weather. All these years I have been doing most of my own repairs, as well as those of friends. Recently I have decided to take my passion to the next level. I have completed a Cycling Mechanics course. 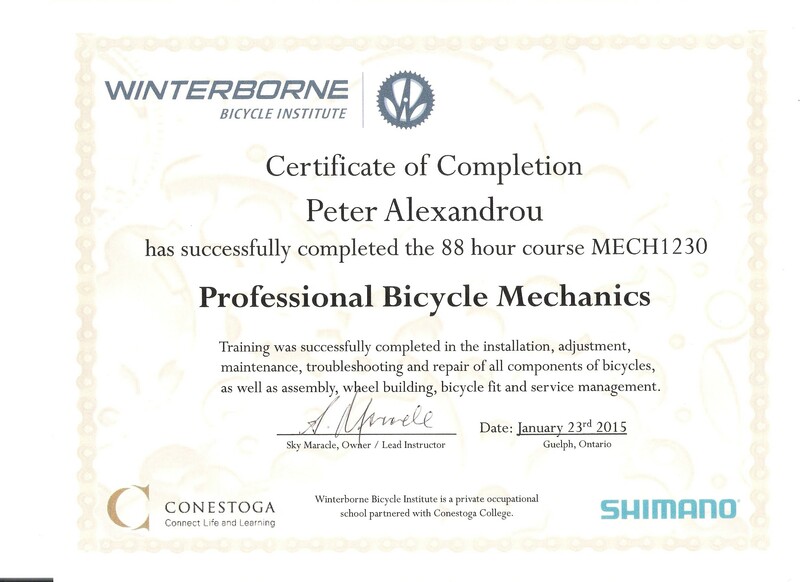 An 88 hour intensive hands on course offered by Winterborne Bicycle Institute, Canada, co-sponsored by Shimano. Topics included everything from tightening brakes to wheel building.